Liege waffles are easy to bake at home for family and friends. With a few helpful pointers, you’ll be on your way to golden, crispy, caramelized bites of happiness aka perfect Liege waffles every time! When baking, ingredients generally should be introduced to one another at room temperature (unless otherwise specified in a recipe.) This applies to eggs, butter and milk. 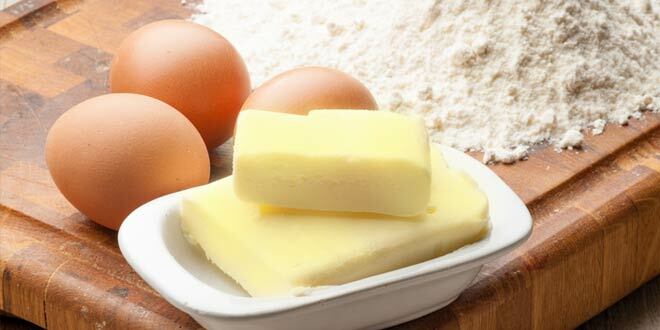 Adding cold eggs to butter could cause the butter to harden and make ingredients difficult to mix. Room temperature eggs won’t disturb the other waffle ingredients and allow the dough to rise naturally. 2. Using the wrong butter. Ensure your Liege waffles will have the signature lush taste by using the proper butter.Choose a butter with higher fat content. Selecting a European butter with minimal ingredients at your local market is a safe bet for truly amazing waffles. Also, note the color of your butter. A good rule of thumb: butter with a natural golden hue is better in flavor than a butter that’s pale or white in color. 3. Using less than great ingredients. Check expiration dates. Test for freshness. Give each ingredient a good sniff, look and/or taste before adding it to the mixing bowl. Each ingredient, from flour to Belgian pearl sugar, is an essential component and using high quality ingredients will give your Liege waffles superior flavor and texture. Dough is a precious thing so we recommend treating it like so. Fold gently and until all ingredients are combined without lumps. No more, no less. Mixing the dough excessively will over-develop the gluten and give your waffles a tough texture. 5. Rushing the dough’s rise time. Always follow your chosen recipe and give the dough the chance to double in size and get fluffy. Pick a place where the dough will be undisturbed and have the proper temperature to rise. (Try the inside of an unused oven or a draft-free countertop.) Your patience will be rewarded when you into delightfully crisp, perfectly toothsome Liege waffles. 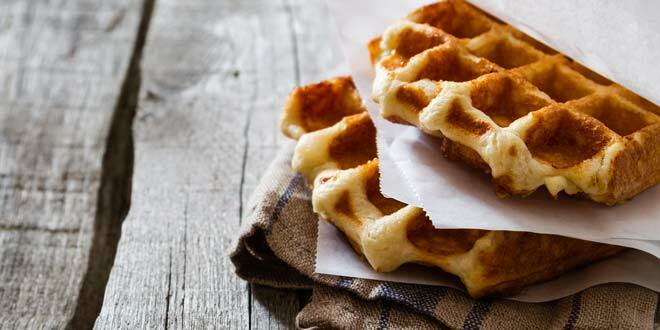 Avoid these Liege waffle “don’ts” for sweet waffle perfection every time. Have your own Liege waffle baking tips? Share them with a comment below! Which Stand Mixer Should I Buy? Usually is Liege Waffle dough with it toughness, same as pizza dough, bread dough or…? Thanks for your question! If you’re planning to start a waffle business, you may want to consider a commercial-grade stand mixer. We recommend choosing a trusted brand with the horsepower and features you need. 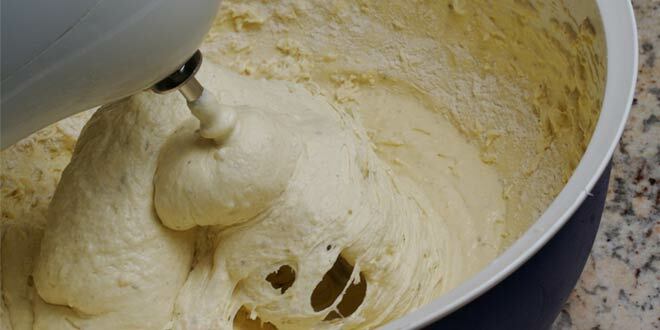 A good stand mixer will be able to mix up a variety of doughs. Best of luck in your endeavors and happy baking! I agree with all the points above except for #4. Liege waffle dough is a very enriched brioche-like dough, and as such, needs intensive mixing to achieve the proper gluten development. For the typical Liege waffle recipe with a +/-60% butter content, you’ll need a beater on a medium speed for several minutes to achieve a smooth windowpane. Mixing the dough gently, and just until combined, is a good suggestion for pancake batter. However, if you do this with Liege waffle dough, you’ll end up with a thick scoopable batter that gives you a thick cakelike waffle rather than a soft, workable dough. We mix ours for 5mins #2 setting. Adding the Pearl’s at the 4 minute mark. I’m learning so much on how to make a perfect liege waffles. 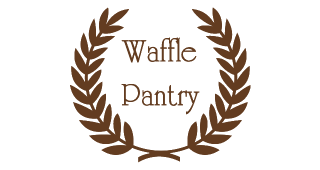 We are adding waffles into our business menu and need all kinds of information. Thank you for all the good ideas. Hello, tonight I was following your recipe and have a question. When I add the yeast to the Luke warm milk, I am not seeing much of a reaction even after 10 minutes. I’ve tried three times; should it froth? I am using the red label SAF instant yeast. Hi Todd, thank you for your question. You should not expect to see any noticeable change or reaction when initially adding the yeast to the luke warm milk. The real fermentation process of instant dry yeast will begin at the end when you let the dough rest for 2 to 3 hours. Cover the dough with a kitchen towel or plastic wrap and keep it in a relatively warm place. The Red SAF instant yeast will work great results for you and you should expect to see the dough double in volume. Happy Baking! Hi. I have a growing obsession with Leige waffles lately. I tried making them today howeverI didn’t achieve the kind of waffle I like. I’m aiming for a texture and softness similar to the commercial Wafflemeister waffle. The recipe I followed tasted good but I find it too crunchy and the bread is not stretchy like wafflemeister’s. I’m wondering if I followed the right recipe to achieve the one I like. Please give me some tips if you are familiar with Wafflemeister quality. Hi Kim, thank you for the great question. 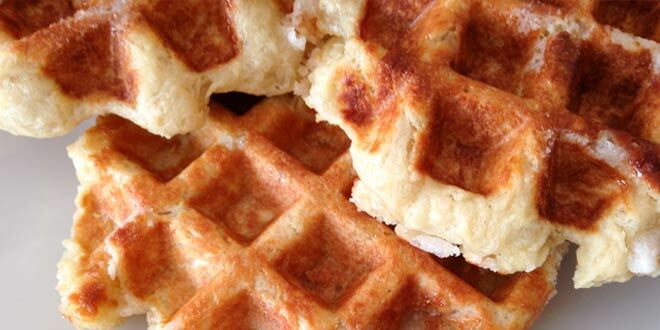 The texture of the Liege waffle dough is very important, and it is for that reason that bakers in Europe work with very high quality flour when preparing Liege waffles. We suggest using an even mixture of the French T55 and French T45 flour. For more information, please feel free to refer to our previous blog post ‘French T55 Flour: The Preferred Choice for Liege Waffles’.